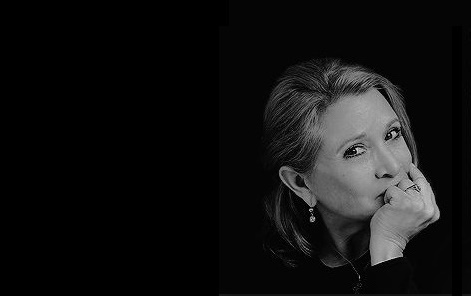 Carrie Frances Fisher (born October 21, 1956-December 27, 2016) was an American actress, writer and screenwriter known for playing Princess Leia Organa in the Star Wars saga. (Films IV to VIII). In 1987 he published a semi-autobiographical novel titled Postcards from the Edge, which was aired three years later by director Mike Nichols with a homonymous title and played by Meryl Streep in the role of Carrie and Shirley MacLaine in that of his mother, Debbie Reynolds. Daughter of singer Eddie Fisher and actress Debbie Reynolds. He had a younger brother, actor Todd Fisher, and his paternal grandparents were Jewish immigrants from Russia; By maternal part, their ancestors came from England and Scotland, of evangelical religion. He appeared in some productions with his mother before beginning his first film work, when he portrayed Warren Beatty's seductive young girl in Shampoo (1975) by Hal Ashby. 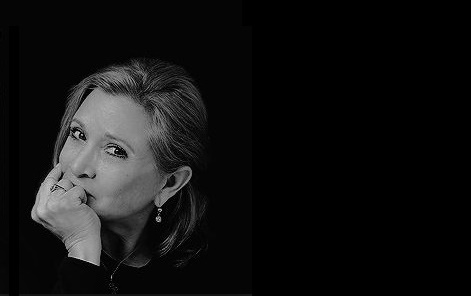 Two years later came the role for which Princess Leia Organa was widely recognized, in what was initially known as Star Wars (1977), an interpretation she repeated in the continuations The Empire Strikes Back (1980), The Return of the Jedi (1983) and, 32 years later, in The Awakening of the Force (2015). In between, in 1980, appeared in The Blues Brothers. After these successes he fought against dependence on drugs and alcohol and lived a brief marriage with singer Paul Simon. His film career suffered considerably, reflecting on the poor quality of the films he played, such as Under the Rainbow (1981) and Hollywood Vice Squad (1986), with the exception of the 1986 Hannah and his sisters three-time Oscar winner. From then on she worked as a secondary actress, in comedies such as When Harry Met Sally ... (1989), Sibling Rivalry (1990) and Soapdish (1991). She also worked as a writer, publishing in 1987 the semi-autobiographical novel Postcards from the Edge. In 1990, director Mike Nichols commissioned the film adaptation of his book, with Meryl Streep as Carrie and Shirley MacLaine in the role of his mother at a time in his life. Fisher continued to write and published other novels such as Surrender the Pink and Delusions of Grandma. In 2001 another screenplay of his screen appeared: the telefilm These Old Broads, with a quartet protagonist of luxury formed by its mother Debbie Reynolds, its old enemy Elizabeth Taylor, Shirley MacLaine and Joan Collins. Fisher publicly reported on problems with drugs, his battle with bipolar disorder, and antidepressant addiction on ABC's 20/20 television program. In September 2009 he published a biography called Wishful Drinking, where he narrates his experiences in humor, laughing at his tendency to alcoholism and his sentimental failures. In one of his most revealing interviews in October 2010, while in Sydney, Australia, he confessed to his strong cocaine addiction during the filming of Star Wars: The Empire Strikes Back (1980) and survived an overdose. "Little by little I realized that I was using drugs a little more than other people and that I was losing my control over them ... I gave so much to the cocaine in Star Wars that even John Belushi told me that he had a problem". On December 23, 2016, she suffered a massive heart attack while on a flight that took her from London to Los Angeles, and resuscitation measures were immediately applied. She was transferred to a medical center of the city in serious condition. The popular American actress was realizing the tour of promotion of its new book, the princess diarista. Finally, on December 27, 2016, he died at the UCLA Medical Center. A statement from her daughter Billie Lourd confirmed her death. The following day, December 28, 2016, her mother, actress Debbie Reynolds, while preparing her daughter's funeral, died of a stroke. 2012 | It's Christmas, Carol!